With Braun’s current flagship shaver — the Series 9 — still being offered at a premium price, the tried and tested Series 7 is looking increasingly more like a very compelling alternative. Moreover, for the majority of men, the Series 7 still represents the best choice as it’s a great compromise of performance and costs and very few men will really benefit from the features of the more expensive Series 9. The Series 7 is an excellent option for men with sensitive skin that suffer from razor burn, but also for anyone looking for a high-quality electric shaver that is capable of providing close and comfortable shaves. There’s a plethora of currently available Series 7 variations and trying to decide which one to buy can be frustrating and confusing. Things are actually much simpler when we consider the differences between the Series 7 models that actually matter. In this post we’ll address precisely that and help you narrow down your options so you can make the right buying decision. 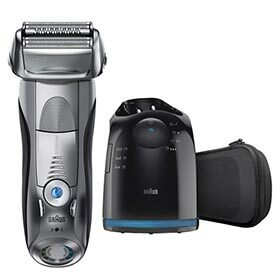 The Braun Series 7 was first launched in 2010 and it quickly became one of the best-selling electric shavers of all time and a mainstay in pretty much every list of recommended shavers. It was and still is highly acclaimed for its performance, particularly for the supreme comfort it provides during the shave. For the other manufacturers, the Series 7 was the shaver to beat as it quickly became the unofficial benchmark in the industry. Its main selling points were the unmatched comfort, close shaves, reasonable price of the replacement shaving heads, excellent cleaning station and a robust build quality, despite a couple of well-known issues. First, the head locking mechanism was prone to breaking if you tried to move the shaving head when locked in the fixed position. The second issue is related to the paint right below the shaving head that would sometimes flake and chip after a couple of years. This is caused by the alcohol-based cleaning solution that comes into contact with the paint during the automatic cleaning process; however, the damage is only visual. Apart from these overall minor shortcomings, the Series 7 was a complete and highly capable electric shaver that stood the test of time and actually gained some sort of iconic status in the shaving community. The 790cc is probably the quintessential Series 7 as all the other variations are derived from it, be it by adding or removing certain features. It’s important to note that these features don’t affect the actual shaving performance in any significant way. This goes for all Series 7 variations as you’ll see next. The Series 7 has been around for quite some time since its introduction, so Braun decided to give it a refresh. In 2016 new models were introduced and this probably caused even more confusion. The names don’t really make any sense and Braun also used some marketing terminology in an attempt to make the update look more than just a cosmetic makeover. In reality, the differences compared to the older Series 7 shavers are mostly minor. All the newer Series 7 models are suitable for wet & dry use; in the past, there were both dry only and wet/dry variations, like the 790cc and the 799cc respectively. Also, the wet/dry models (both older and newer) cannot be used while charging as a safety precaution. This was however possible with the (older) dry only shavers. You have the option of a silver, grey or black color Series 7 (market specific). The newer Series 7 use the same shaving heads as the previous models (70s and 70b cassettes), even though Braun says they have 4 shaving elements. They don’t, the so-called SkinGuard doesn’t count as an active element. The new marketing terms (Protective SkinGuard, 8-D shaving system, MacroMotion etc) don’t really refer to any new additions that weren’t already present on the older models. The personalization modes (5 of them with the newer shavers, from extra sensitive to turbo mode) continue to be of little to no use. In theory, you would use them to adjust the output of the motor — less power for shaving sensitive areas, more for shaving thick, dense stubble. In reality, they just make the shaver feel slow and you should use the highest setting all the time as the Series 7 remains adequately comfortable. The automatic cleaning stations included with the newer shavers lack two features that were specific to this series: the induction heating mechanism for actively drying the foils and the quick clean option. The latter was only available with certain older cleaning stations. They are now completely gone (more details later on). Some of the newer variations come with an updated LCD display (7865cc, 7850cc, 7893s). You can easily tell the new shavers apart from the older models as the updated Series 7 shavers follow the 78xx naming scheme. For example, the models for the North American market are the 7865cc (grey), 7899cc (silver), 7898cc (silver), 7893s (silver). The new Series 7 7865cc comes in a grey color scheme. Other model names like 7850cc or 7880cc that are primarily sold on the European market are pretty much identical to their corresponding American models. As it was the case with the updated Series 9, Braun tried to unify the Series 7 line with this update. As a result, all the shavers are now suitable for wet/dry use, they all cost the same on Braun’s website (previously the dry only variations were cheaper) and they even ditched the model names altogether on their UK site and only refer to them as Series 7 Silver or Series 7 Grey. * The Series 7 7790cc is an oddity — both the model name and the features are not in line with the rest of the shavers. It’s a dry only razor, but has the updated LCD display and comes with the updated cleaning station, so it lacks the induction heating system and the quick clean mode. At this point I think we can safely say that all Series 7 shavers will provide the same shaving performance, regardless of other features. What are the things you should consider when buying a Series 7? When trying to decide which Series 7 would be more suitable for you, there are only a few things you should factor in. 1. Wet & dry use. If you won’t be shaving in the shower or with shaving cream/gel, then you probably should opt for a dry only variation as they usually cost less. The Series 7 790cc (7790cc) will probably be the best choice for most men. For wet shaving, the 799cc, 797cc or any of the updated models like the 7865cc/7850cc/7893s are equally good options. 2. The inclusion of an automatic cleaning station. As you probably know, the Series 7 is available with or without an automatic cleaning station. The station is included only with the cc models like the 790cc, 7865cc etc; the s models (like the 740s or 7893s) don’t come with one and usually cost less. However, you’ll probably want a Series 7 that comes with a cleaning station for the added convenience. Just like the Series 5 and 9, the Series 7 can be difficult to clean manually because the inner blades and the foils are merged into a single piece — the cassette — and it offers limited access for a thorough cleaning. In time, fine hair clippings, dead skin and dirt will remain lodged inside no matter how thorough you are. This is where a cleaning station is very useful, even though you don’t have to use it after every shave. In fact, you shouldn’t. But do keep in mind that the cc models are a bit more expensive and you’ll also have to buy refill cartridges. You can find cheaper alternatives to Braun’s solution or even make your own, but be aware that this may void the warranty. Does the Series 7 cleaning station work with s (solo) models like 740s and 7893s? This is one of the most commonly asked questions about the Series 7. And the short answer is YES, it works. Now, there is a bit of a nuance to that statement. First of all, the cc variations feature a special coat of paint that can withstand constant exposure to the cleaning fluid. The s models don’t have it, so in time the alcohol-based solution will affect the outer finish. The damage will only be visual. Braun officially recommends against using the S models with a cleaning station because of that, but there are many users that have successfully done so. And to be perfectly honest, this is a problem that affects the cc models as well and the area right below the shaving head will eventually start to flake, despite featuring the special paint. The Series 7 solo models are the only ones in Braun’s lineup that will work with a cleaning station. The rest of them — the Series 3, 5 and 9 — will NOT. That’s because despite looking identical and even featuring the two metal contacts on the back, they lack a special chip used by the cc models to communicate with the station. The Series 7 is an exception to this rule and even the s variants are fitted with that particular chip. So if you’re planning on getting an s model and use it with an older Series 7 station for example, you can do that; or maybe you plan on buying a solo model and get the station separately later on. Please note that in case anything goes wrong you are fully responsible and the warranty won’t cover any damage. As mentioned previously, the cleaning base of the updated Series 7 lacks the induction heating system and the quick cleaning setting that were present on the older stations (790cc, 797cc, 799cc etc.). The new Series 7 cleaning station (no induction drying or quick clean mode). Part number is 81622438. I wouldn’t say that this is a deal breaker, but it is a letdown to see two unique features that made the Series 7 station that much nicer gone for good. In practice, this means that with a newer Series 7 like the 7865cc you won’t get a cleaning station fitted with a system that actively dries the shaving head after the cleaning cycle. The Series 9 station uses a fan, while the older Series 7 used induction heating. Induction heating was an optimal solution as it was very fast and completely silent. A Series 7 that comes with the older station will be perfectly dry after 30 to 40 minutes, while the newer 7865cc for example will need a few hours for the alcohol-based fluid to naturally evaporate. UPDATE: It appears that Braun phased out the older stations for all the Series 7 models that are currently being manufactured, including the 790cc. All the Series 7 now come with the new cleaning station, meaning no induction heating or quick clean mode. Also, there is no additional model name/number to differentiate between the 790cc shavers that come with the old or the updated station. Again, I personally don’t consider this to be a major drawback — the station still does a great job at cleaning and lubricating the shaver — but I admit that I would rather have a nice feature than not having it. You can still get it with some of the older 790cc/799cc/797cc that were manufactured previously, but you’ll have to thoroughly check it with the vendor. Finally, you could get the old station separately from several online stores. 81365080 — this is the old model that has both the fast clean mode and the inductive heating system. You can get it from here: Amazon, Encompass, shavers.co.uk. 5675 — this station is actually available in several variations despite all of them having the same part number. It can come with or without the inductive heating element, so unless you know with certainty that it does have it, the station above with the part no 81365080 is probably the one to have. 81622438 — this is the new, updated station that ships with the latest Series 7 (no induction heating and no quick cleaning). Dropping the induction heating system is definitely a cost reduction measure from Braun; we also saw it with the Series 5 cleaning station that also lacks any drying mechanism. Another reason for this could be Braun’s very own Series 9; being the company’s top of the line shaver, it needed a premium feature to stand out from the other lower-end shavers. If you can find a Series 7 that checks pretty much all the boxes and is significantly cheaper than other similar Series 7 shavers, definitely go for it. As I said previously, the difference in performance throughout the entire series is negligible. For example, the 790cc has 3 personalization modes, while the 797cc has 5. Will this translate into any noticeable improvements in the actual shaving experience? Nope. Just buy the one that is more reasonably priced. Before making your purchase check out both the older and updated Series 7 models as their price seems to fluctuate quite a lot. All Series 7 use the same replacement shaving head — the 70s (silver) or 70b (black). Also, all Braun cleaning stations use the same cartridges, so your costs of maintenance will be the same regardless of which model you end up choosing. 4. Color scheme and included accessories. I guess these details can matter to some extent; if for example you absolutely want a black Series 7, then you can buy the 760cc, the 740s or one of the new 78xx models (country specific). Some models have different travel cases (plastic, textile, faux leather) or slightly different LCD displays, but again, nothing dramatically different. What are the differences between the most popular Series 7 models and which one should you choose? As a general guideline, I would say to simply buy the one you can find cheaper, provided it meets your personal requirements (wet & dry use, clean & charge station etc.). My personal picks would be the 790cc for dry use and the 7865cc/7850cc for wet & dry use. The wet & dry 797cc is getting increasingly harder to find or is very expensive. Usually the 790cc and 7865cc will be the ones to buy as they don’t cost a lot more than the solo models and I think the cleaning station is worth having. These two are probably the best-selling Series 7 of them all. Luckily, choosing one or the other is very straightforward as the only noteworthy difference is related to wet & dry use. Precisely, the 790cc is a dry only shaver, while the 799cc is suitable for wet & dry use. That’s it. Depending on how you prefer to shave you can opt for either of them. As it’s the case with all wet/dry shavers, you cannot use the 799cc while it’s plugged in. 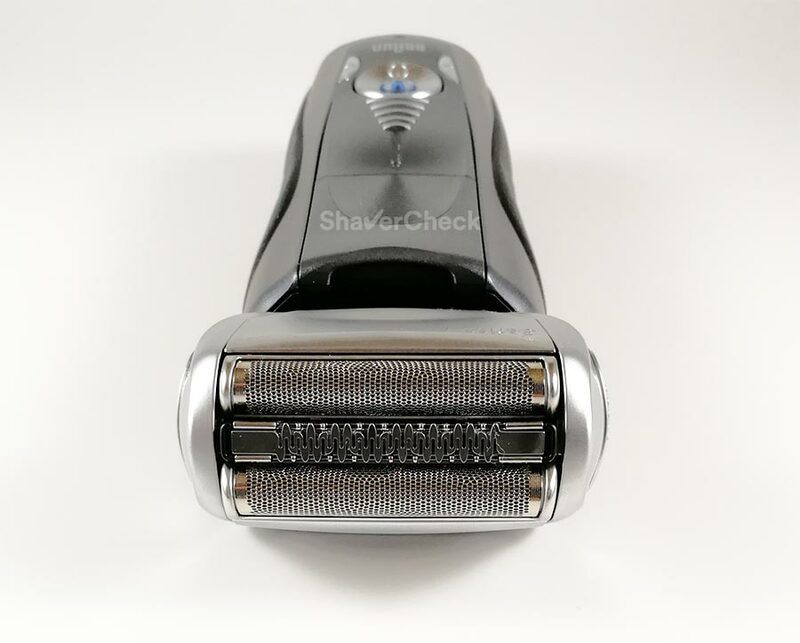 The 790cc, being a dry only shaver, doesn’t have this limitation and you can shave with the razor connected to the mains. The 790cc is almost always priced lower than the 799cc. Both use the same replacement shaving heads (70s/70b) and come with the same cleaning station. The –x used by Braun for variations of the same shaver signifies an incremental, usually minor improvement. It also designates shavers sold in different parts of the world, even though they are identical. In this case, the 790cc-4 has 3 personalization settings (sensitive, normal, intensive), while the original 790cc only had one speed setting. This is a rather gimmicky feature as I mentioned previously and it won’t make any real difference. It’s also worth mentioning that nowadays all 790cc shavers are actually the -4 variant, even though the retailers don’t always list it explicitly as the 790cc-4 and almost everyone refers to it as 790cc, including me throughout this post. It’s very easy to spot the 790cc-4 as the old 790cc didn’t have the two personalization buttons below the ON/OFF switch and it came with a white cleaning station (pictured below). It’s also discontinued and nowhere to be found. The 790cc-4 includes a zip up travel case instead of the plastic one that came with the very first 790cc. Bottom line: the Series 7 790cc vs 790cc-4 is a non-issue nowadays. This is another case of dry only vs wet/dry Series 7 and there’s no clear winner as your decision should only be based on your shaving preferences. The 7865cc is a recent iteration of the wet & dry 799cc, with 5 personalization modes and touted as a totally new shaver, but in reality it’s pretty much the same. You can check out my 7865cc review to get all the details. The cleaning station included with the old 790cc used to be fitted with the induction heating mechanism and the quick cleaning mode, but it’s not anymore. To sum it up: buy the 790cc if you shave dry or the 7865cc if you prefer to shave in the shower or with shaving cream/gel. The 7850cc is a very popular model in Europe that can now also be found on various online stores in the USA. There are really no differences between the 7865cc and the 7850cc, so my advice would be again to simply get the one you can find at a better price. The same goes for the 7880cc that comes in a matte black finish. Other than that, it is identical to any other cc models from the updated Series 7. The 797cc features 5 personalization modes vs only 3 in the case of the 799cc. The two additional settings are an extra sensitive mode and a turbo mode that supposedly is 12% faster than the high power setting of the Series 7 shavers that only feature 3 modes (like the 799cc). As mentioned previously, in practice this turbo mode doesn’t seem to improve the results by a noticeable margin. However, since the 797cc usually costs less and it’s easier to find, I actually recommend it over the 799cc. Both have the older, more feature-rich cleaning station. The Braun Series 7 760cc used to be a great inexpensive alternative to the full-fledged 790cc. While the shaver was almost identical, the cleaning station that was included with the 760cc had some of the features removed: no quick clean mode, no automatic cleaning function and no hygiene indicator. This wasn’t necessarily a deal breaker and considering that it was priced significantly lower than the 790cc, it was actually the better option in the past. These days the price is pretty much the same, in which case the 790cc is the shaver to buy. Moreover, it has an upgraded LCD display and comes with a faux leather pouch instead of the textile one. The 7893s is one of the more popular solo models. It’s part of the refreshed Series 7 generation, it’s suitable for wet & dry use and it obviously doesn’t include a cleaning station. Performance-wise, as in how well it actually shaves, it’s identical to the 790cc. But since the latter comes with a cleaning station and the price difference is usually pretty small, I think the 790cc is a more compelling option. If however you can grab the 7893s for a great price, then by all means you should get it. After all, the cleaning station can also be purchased later on. All the Series 7 models use the same shaving heads and will basically provide an almost identical shaving experience, despite some apparent differences that would suggest otherwise. Hopefully this post cleared up some of the confusion regarding the Series 7 and the various models. I will keep it updated and include new models as they are being released. If you have any further questions, make sure to post them in the comments below. FINALLY, an explanation for why there are both 3-digit and 4-digit model numbers out there for Braun Series 7 shavers! Thank you for providing such a clear and concise summary of the model number history, marketing, and features. Now that I understand the product labeling, I can choose the model that best suits my husband’s needs and my budget. Thank you! Thank you for your kind comment. Glad to hear you found the information helpful. Thanks so much for a great comparison between various models and accessories. Wet/Dry is a key for me, so this was really really great. Thanks again. You are very welcome, Max. I’m glad to hear you found it useful. thanks for the full info!!! far more pertinent info with weeding out the marketing bs. muchos gracias! I spent the last two hours on various sites trying to find the razor that was best for me, and was no closer to an answer than when I started. I spent 5 minutes on this site and was able to identify the right razor for me, and I am very confident with that decision. That didn’t just happen by accident – it happened because this site is very well conceived and designed. Thank you for the kind words, Ralph. I really appreciate it. Great Explanation of the differences in the series 7 models. I have been looking at the 790CC to replace an old Norelco SensoTouch 3D (1280X/47). I do have a couple of questions. is there any difference between the 70B & 70S replacement heads? the 70s is like $10 cheaper than the 70B. Any opinion in which style works better (rotary vs. foil)? I’ve always used rotary. The only foil razor I ever tried was a panasonic like 20 years ago, and I’m sure it doesn’t compare the Braun series 7. Thank you for your comment, Dan. The only difference between the 70s and 70b is the color; 70s is silver, while the 70b is black. Regarding the foil vs rotary question, it really comes down to personal preference. For example, I find foil shavers to give a closer and more comfortable shave compared to rotary shavers. It also allows me to control the razor more precisely. But that’s just my experience, others have found rotary shavers to work better. The only way to know which one would give you better results is to actually try them. Finally an understanding of them all. I was on youtube trying to findout reviews vs each other on them but clearly couldnt and even the brUan web page wouldnt provide even this detailed info. Much appreciated! Thank you for the kind words, I’m glad you found the article useful. This is the most definitive explanation about the Braun 7 series shaver that I’ve ever read. Now I could finally understand what do those numbers mean and be able to pick one for myself. Thank you very much! You are very welcome, I’m glad you found it helpful! From what I can tell, an “s” or “cc” designation after the model just indicates if the shaver comes with a cleaning station (cc) or not (s). I had an older Series 7 cc model and have now picked up a 7893s model. Can the s still be used in the cleaning and charging station? It appears to fit and charge, but I can’t seem to find any definitive answer. As mentioned in the article, the answer is yes, it will work, even though the solo models weren’t designed with that in mind. Thanks so much for your thorough review! I’ve been reading it over and over- I am trying to buy a shaver for my husband’s birthday. My husband has sensitive skin and his razor right now is awful so he uses a handheld with cream at the end. Do you think I should go with a dry shaver and assume it’ll be that much better and he won’t need to use cream? Or is it safer to get a wet/dry? Also do you know what the -4 denotes in the 7 790cc-4? Thanks so much! Thank you for your comment. The Series 7 is one of the most comfortable shavers out there. However, it would be very difficult for me to say with certainty if using it along with shaving cream would make a big difference compared to using it dry. And that’s because shaving is very personal and the results will vary to a high degree from person to person. If your budget allows it, you could opt for a wet/dry model like the 797cc or the 799cc (whichever has the better price as they’re the same performance-wise). All the currently available 790cc shavers are actually the 790cc-4 version and the 4 is actually used to differentiate it from an older iteration (790cc, currently discontinued). I actually touched upon this in the article as well. melanie, definitely get the wet/dry. i have very dry at times and sensitive skin. aftershave burns like a shot of everclear. sometimes dry is better, sometimes shaving with a gel is better depending on what the day is like. ovidiu, GREAT article. you answered all of my questions in one shot, no need to look anywhere else. thank you for your comment. 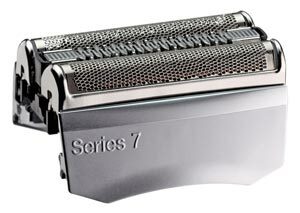 The Series 7 7898cc is the model name sold in the UK and it’s basically the same shaver + wet & dry operation. You can go right ahead and buy it. Thanks Ovidiu for your quick reply. Just curious though as it seems all ‘best razor’ sites tend to end up promoting the 790cc which is ‘Dry only’ but selling in very few outlets and generally more than £200. The 7898cc on the other hand, which you say is Wet and Dry (by the way, I wouldn’t have looked for that feature) is generally available for ca £165? You are very welcome, Steve. Actually price oddities like this one are quite common when it comes to electric shavers; newer, more feature rich models can cost less than others that are arguably inferior. For example, that was the case (and still is to some degree) with the Series 9 and some Panasonic Arc 5 models. Store policies, price bumps from the suppliers etc. can contribute to this. That’s why it’s always a good idea to do a bit of research before pulling the trigger. The 790cc is still very popular, particularly in the USA and most review sites are based there and target that specific demographic. Also, a lot of those reviews haven’t been updated in years and at the time of writing the 790cc was probably the only widely available model. There’s nothing special about it and if you can get a newer model like the wet & dry 7898cc for less money then by all means you should get that one. I tried to cover the most popular models in this article, but Braun has lots of different names for the shavers sold in the different markets even though they are basically the same products. Perfect, thank you for your clarification. I could have assumed the same but it’s good to see confirmation from someone who has clearly done a lot of the homework already. Thanks again, saved a lot of web searching for answers. Hi Ovidiu, sorry it’s me again! I’ve had second thoughts about the cc variants – I can see me quickly not bothering to use it as it should be used. I therefore started looking for an ‘s’ option and found 7855s at £99.99 and 7840s at £149.99 from the same store. Please could you put me out of my misery and advise the difference. All of these variants seem totally confusing, it’s hard to imagine how Braun expect the customer base to understand the numbering system (there seems to be no system) or what they are getting for their money. I totally agree, Braun does a terrible job at documenting the differences between the various models. Regarding the 7855s and 7840s, the color is basically the only difference. I’ve seen the 7855s sold mostly in Eastern Europe and the 7840s is as far as I know made for the UK market. However, both are part of the updated generation (78xx), they come with the same accessories and use the same shaving heads (70s, 70b respectively). All the Series 7 are made in Germany, so you don’t have to worry about differences in quality control or anything like that. With the 7840s you’ll just be spending £50 more for the black paintjob. That’s great, you are a fountain of knowledge, thank you. So apart from the cleaning aspect, the 7855s is the same technology shaver as the 7989cc – if I interpret “the updated generation 78xx as meaning they are all the same? You are very welcome, Steve. That is correct. The technology is the same and the shavers themselves are identical for all practical purposes. The only difference is that the cc models come with a cleaning station and inside the shavers there’s a dedicated chip used for communicating with the station (that’s why an s model will never work with a Braun station that was bought separately later on). Again, the shaving performance is identical. Thanks for this useful information. I need to replace my 790cc model and was hoping to keep the cleaning station and just buy a 7855s to use with it. But based on what you are saying the 7855s won’t work with my old 790cc cleaning station, right? You are very welcome. I updated the article and the information. The 7855s will work with your 790cc station. very interesting here. Does the 7550 model or the 740s (wet & dry) model have an induction heating system that shortens the drying time after cleaning? 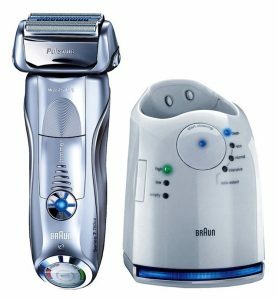 Since I’ve never had an electric shaver, I’m basically a beginner and looking for a great shaver from Braun at a solid price. I bought the Series 3 350cc, luckily I did not need it, so I’ll most likely bring it back. He was just out for a bargain price, so i was so rushed. Instead of 109 CHF only 79 CHF. 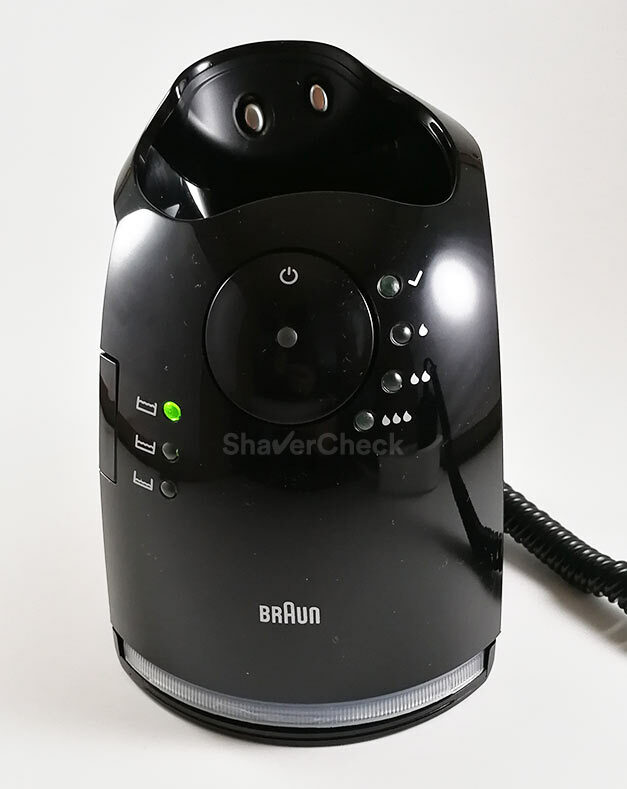 It is important to me when buying an electric shaver from Braun, that the shaving does not break immediately, as I find out from some sources about the Series 7. For me, only Series 5 and 7 in question. The induction heating system is fitted to the actual cleaning station, not to the shavers. The Series 7 7855s and 740s are solo models (hence the “s” in the model name), meaning they don’t come with a cleaning station. As mentioned in the article, you can purchase the station separately later on if you choose so. The older cleaning stations that have the induction heating system can still be found on various online stores (amazon, ebay, shavers.co.uk). thank you very much for your fast answer :). Which one would you recommend to me? As I read in your comments, all Series 7 offer the same performance. All listed can be used in the shower. I can take it without the Clean & Charge Station, because I would save money with pure alcohol and oil using. How should I have to do the cleaning? Remove the razor head and place in to pure alcohol for 15 minutes? Which Series 7 model can I charge during shaving? You are welcome, Emanuele. Yes, the Series 7 is a very good option if you have sensitive skin. Regarding which one to buy, it comes down to your budget and how much are you willing to spend for certain features like the automatic cleaning station. The shaving performance will be the same regardless of your choice. The best way to clean a Series 7 manually would be with a bit of liquid soap and warm tap water. Your user’s manual will have detailed instructions on this. I wouldn’t recommend the use of pure alcohol for cleaning. Just the dry only models can be used while charging (790cc, 760cc, 720s etc.). not to forget, the Series 7 7790cc also works too while the charging. The Series 3 350cc makes an amazing shave. Of course, the Series 3 will most likely not offer the same comfort (for example a less pressure) as a Series 7. It struck me, that if you take out the scissors while shaving and knock out for continue, his work will do the best work in the chin area as well. I’m basically satisfied with my machine, but I would certainly enjoy a Series 7 more, but it costs more than twice as much as my Series 3 350cc. By mistake, I did not dry my face, because some hair was “sticking” and went over it with the shaver. How bad is that? The 350cc is fully washable, but no wet&dry. At the next shave I look to dry properly. That is correct, the 7790cc will work while it’s charging since it’s a dry only model. The Series 7 is superior to the Series 3 in all regards, so you’ll probably be more than happy with its performance, no matter which model you end up choosing. There’s nothing to worry about with regards to your face not being completely dry when using the 350cc. Yes, this can be detrimental to the comfort and the closeness of your shave, but definitely not to your razor. If you can safely rinse a shaver under tap water it can definitely handle some skin moisture. Thank you for the easy to understand explanations of the Braun shaver series. I have decided to go with the Series 7 instead of Series 9, as it seems the Series 9 is made from more plastic parts (housing and head) and the cutting block foil heads are notorious for being flimsy and breaking easily. Question: Do you know if the defective head locking mechanism that was prone to failure on the 790cc has been corrected on the updated 7865cc model? Not to my knowledge. I would still be extra careful when using the shaver with the head locked into position. I don’t think the mechanism can crack during normal use, but rather when you forget the lock is activated and you try to move the head. Thank you for your detailed comparisons. Do you know if the head lock mechanism that was prone to breaking on the 790cc model has been fixed on the 7865cc newer series? That is correct, the cleaning station that comes with the Series 7 7865cc lacks the induction heat system and the quick cleaning mode. I would personally stick to the 797cc. Thank you, sorry about all the typos. Very helpful article. I also appreciate your quick response time. Do you know why those features have been removed? You are welcome, Larry. Most likely cost reductions – no induction heating components and a simplified manufacturing process. The lower end Series 5 and 3 also don’t have any systems to actively dry the shaver and now the Series 7 will join them. 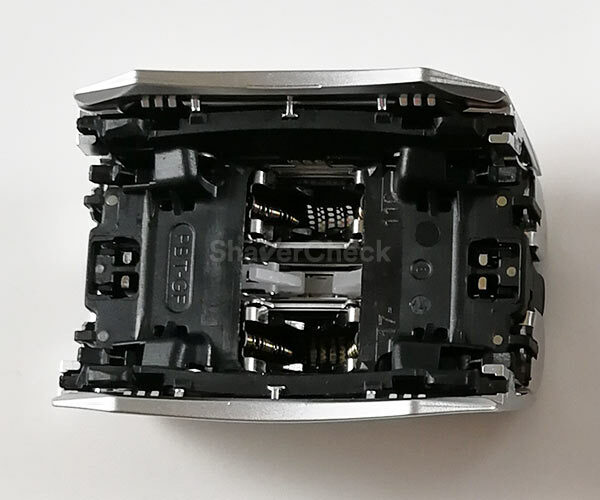 Hi, is this true, that 799cc-7WD has the same steel foil placed into the shavinh heads like series 9 ? And what about the 7899cc according to the question above? I’ve just found the 7899 cc cheapper than the 799cc-7WD, so would be grateful for your advise? All Series 7 variations use the same shaving head, the 70s or 70b cassette replacement. The 7899cc is identical to the 799cc in terms of shaving performance, so you can confidently buy the cheaper one. The only real difference between them is the cleaning station – the one included with the 7899cc lacks the quick clean mode and the induction heat system used for drying the shaver. Hi Ovidiu thank you for post8ng that amazing article! I like many have been doing loads of research and was going to buy the 7840s in the Black Friday sale but missed out. There are still 7855s for sale at a decent price but I couldn’t find anywhere till now that even described them! 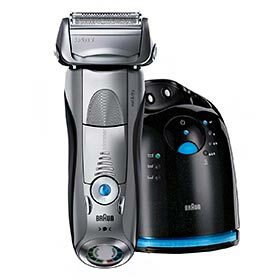 I want a new razor to upgrade from a Braun 340s which doesn’t shave close enough. Do you think I will notice significant difference with a 7855s? Thank you for the kind words. A Series 7 will be a solid upgrade coming from a 340s. It’s a superior shaver in every aspect. 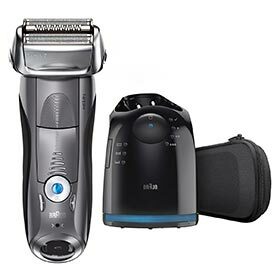 However, the closest shaving electric razor in that price range is in my opinion the Arc 4 from Panasonic (for example the ES-LA63-S), but that one comes with a small trade-off in comfort compared to the Series 7. If you have sensitive skin, I suggest you to go for the Series 7, especially if you can get a great deal on it. Hi Ovidiu. Somewhere I read that the wet/dry option allowed cleaning with water instead of the cleaning station; thus saving the purchase of the replacement parts for this purpose. Is this possible? If its is would I go with the 797cc? It’s definitely possible – with the 797cc or any other electric shaver. Even if it comes with a cleaning station, you don’t necessarily have to use it; it’s there for the added convenience as it takes care of everything for you. However, you can definitely clean your shaver manually if you choose so. Most modern shavers can be safely cleaned with a bit of liquid hand soap and then rinsed under tap water. Just make sure to read your user’s manual and follow the instructions for a manual cleaning. Thanks Ovidiu. Great website. BTW, since the 790 is waterproof, I may not have to go to the wet/dry option in order to allow cleaning with soap and water. Is this correct? You are welcome, Fred. That is correct, you do not have to buy a wet/dry variation of the Series 7 in order to clean the shaving head with water. The dry only 790cc can be safely rinsed under tap water. Generally the wet/dry label refers to using the shaver with cream/gel or in the shower. 1- Can the 7865 be used in my old 790cc-4 Cleaning Station which is still in great shape and what is the difference in the two cleaning stations ? 2- Is the newer 7865 any quieter than the 790cc-4? 3- I have the opportunity to buy a new 790cc (had my existing one for 5 years) or a 7865 at two different stores for about the same price! Is there any advantage with one over the other? 2. They are the same in this regard. 3. The 7865cc can be used wet or dry, while the 790cc is a dry only shaver. The 790cc can also be used when charging. The station included with the 7865cc lacks the induction heating and quick clean mode found on the 790cc station. Unless you’ll be using your Series 7 for wet shaving, the 790cc is actually a better option in my opinion. 1- I know the 7685 can be used wet or dry when shaving which I wouldn’t be using but for cleaning under the tap water, is it safe to do this with the 790, which I would require when going away for a week or two where you wouldn’t have the cleaning station. In the past I would just use the brush after taking off the foil cutting head as I thought running it under the tap and taking off the cutting head for a thorough washing would cause a problem but perhaps it won’t if I were to do it every few days! 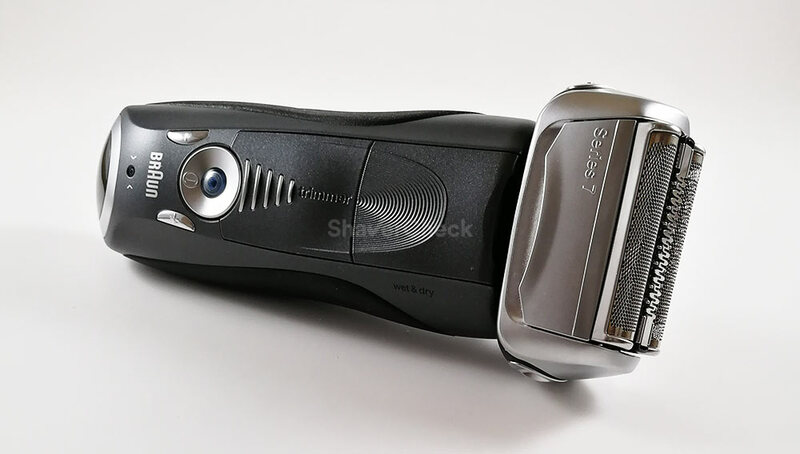 2- I noticed the power cord in the 790 can also charge the shaver along with a shave when the charge runs out, which I understand cannot be done with the 7685! 3- Is the heat induction any better than a fan which I understand is in the 7685, it seems the fan would possibly be quicker but could break down easier! 1. You can safely clean the 790cc under tap water, Braun actually recommends this as a manual cleaning method. You just can’t use it to shave in the shower or with cream/gel. 3. The 7865cc doesn’t have a fan either; it doesn’t have any system to actively dry the shaving head once the cleaning cycle is complete. The cleaning fluid will naturally evaporate, which takes at least 3 to 4 hours. Induction heating is the best in my opinion, it’s quiet and fast. I own a Series 9 9290cc that uses a fan and the drying takes longer than induction heating. I haven’t used it long enough to comment on the reliability of the fan though. The shavers are the same, the model names differ depending on where they’re being sold. Great article! Whereas the Series 7 razors of old and new are broadly similar – the same cannot be said for the cleaning stations. I notice one massive ommision. The clean and renew cleaning station from the 790cc-4 of the past have a 5 stage cleaning action that takes 40 minutes and includes drying by an induction heat mechanism. The newer Series 7 – for example 7898cc have a 4 stage cleaning action taking roughly 15 minutes and no drying process. I phoned Braun Customer services to ask why my 7898cc would was wet after a cleaning cycle and i was told that my old 790cc-4 had a cleaning station with an induction heater – the newer razors don’t. I loved my old braun 790cc-4 and i find my 7898cc-4 just as good – except the cleaning station lets it down. i have ordered a cleaning base from http://www.shavers.co.uk for £35 which has a heating induction mechanism. looks like Braun are cutting cost…. this is very apparent on the Series 9 which has plastic on the body of the razor. I was disappointed and went back to the trusted series 7!! You are absolutely correct, I actually mentioned the same thing in a previous comment about the cleaning stations of the newer Series 7. I will update the article as well to reflect this particular aspect about the newer models. 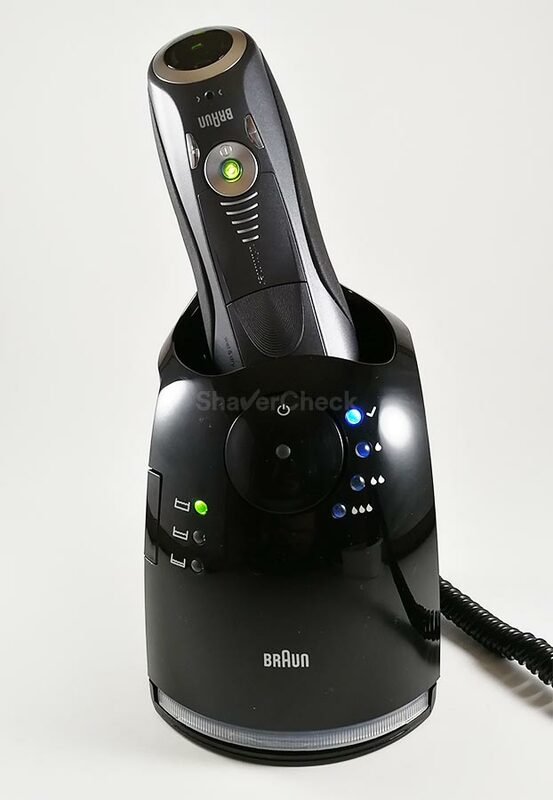 Also, as far as I know, a 7898cc shaver won’t work with the previous generation cleaning stations that include the induction heating mechanism (I assume that you intend to use the station from shavers.co.uk with your 7898cc). The same goes for the 790cc, you can’t pair it with a newer cleaning station like the one included with the 7898cc. Just to let you know the 7898cc is backwards compatible with the previous 5 action cleaning stations with induction heat mechanism. Hope this helps – works exactly as my old 790cc-4 did. no more wet razor!! thanks to Andrew at http://www.shavers.co.uk for his knowledge and advice and free next day despatch!! Thank you for the follow up, Vaqaas. That is actually very interesting. Do you happen to know if that particular station is a genuine Braun part or if it was modded in any way? I am asking this because a Braun representative explicitly told me that the newer models are not backwards compatible with the older stations fitted with the induction heating system. Firstly a humble apology for spelling your name incorrectly in last comment. It’s a 100% genuine part and as I mentioned I phoned Braun customer services and asked the question on newer models not having induction heater. Braun customer services connected my call to Olympic Shaver Centre (www.shavers.co.uk) as they are Brauns authorised retailer in my district. This is how I came into contact with Andrew and he supplied the original part in sealed retail box and told me it was backwards compatible – and when it arrived yesterday I tested it and it worked perfected. Tested it again too and it’s awesome. No worries, Vaqaas. Thank you again for your detailed reply. I can only assume that Braun’s customer support rep was actually wrong about this when he replied to my inquiry. Greetings from Turkey. Best and the most specific review i have ever read. Thank you. Thank you for your kind words. I’m glad to know you found the information useful. Thanks for the great article. I just received the 7865cc for Christmas. What has me so confused are the battery lights. Can you explain them as I am considering a call to Braun thinking it’s defective. I have one that’s completely lit (at 3 o’clock), the light at 6 o’clock is half solid and the one at 9 o’clock is not lit at all. Thank you for your comment. I totally agree, the battery status lights are counter-intuitive and unnecessary complicated. The one at 9 o’clock is the low-charge light, it will blink when the battery is almost drained (you can still shave once or twice when that happens). The light at 3 o’clock represents a full battery, while the one at 6 o’clock stands for a 50% charge. 1. As to the cleaning station, am I to understand from your article that it is useless with the s series, or just that certain features don’t work. 2. How do we know which cleaning station we have (mine looks a bit different than those pictured above). 3. Costco carries the 7893. Can I presume cc, or possibly s? 1. I updated the information, an a Series 7 s model will in fact work with a cleaning station. 2. You can identify the station by the shaver’s model number (you didn’t mention your prior razor, so I’m afraid I cannot help you here). 3. Definitely the 7893s, so no cleaning base. I pulled the trigger and bought the 7865cc, mostly because of the wet+dry function & the cleaning station. I need to be clean shaven for work at my new job, have the Braun BT3040 and maintained a 2mm or 3mm beard at my old job where we could get away with a lot at work. Im planning on using it in the shower with shaving gel most times and I have 2 questions. Does a certain shaving cream work better with the electric shaver? Also would just rinsing the head under water after shaving with shaving cream for a couple days & then running it through the cleaning station damage the shaver in any way? Any quality shaving cream should work just fine. I use Proraso, Speick and Nivea most of the time as they’re inexpensive, widely available and the quality is excellent. You can check out more options here. Regarding the cleaning, you can definitely perform it that way, just make sure to rinse the shaving head very thoroughly. I always clean my shavers with a bit of liquid soap whenever I use shaving cream. That’s simply because lather residues tend to dry and harden very quickly and are a real pain to clean later on. Using a few drops of liquid soap should only take an extra minute. 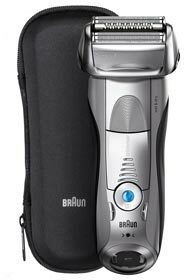 Besides, Braun requires the shaver to be completely dry and free of any foam residues before using the station. Ovidiu, just wanted to express my gratitude for your article. It helps me find a perfect shaver for my bf in just 10 minutes – really, your effort is very much appreciated! Thank you for your kind words, I’m glad you found the information useful. I hope your boyfriend will enjoy his new shaver. Looking to get my son a shaver. Walmart has the series 7 790 for $249.99 Canadian & Best Buy has the series 7 7893s for the same price. Which one do I go with? The 7893s model is suitable for wet & dry use; the 790cc is a dry only shaver, but includes an automatic cleaning station. The 790cc would probably be a better pick for the added convenience of the cleaning station and it can also be used while charging. Most men prefer dry shaving anyway as it’s quicker and less messy. I have no words to say tks! So many letters and so many models that drive us crazy. Very helpful explanation and honest. Thank you so much for your comment, I’m very glad to hear that! I have a Braun series 7 7893s and it does work with my clean and renew base I bought off of eBay. I have an 7505 Braun, and like the fact that is on an electric cord and can carry it and charge it anywhere – health club, hotel, etc., without a charging station. I always dry shave. I almost purchased the 790cc and then recognized that the cord is for the charging station, and not directly to the razor. Are there any mobile razors like the 7505 that I can easily carry and connect to an electric cord? You can also plug the charging cord of the 790cc directly into the razor, so you’re not in any way restricted by the inclusion of the cleaning station. You can charge the razor via the station or directly using the same cord. Since you always shave dry, the 790cc seems like a great option as you can also use it while charging. OK. I am going to buy it. Your written reports of the Series 7 and Series 9, and comparisons within each and against each other are excellent and really made me think about things. You are very welcome, David. I’m glad you found the information useful. Thanks so much for the well written article. It has been a great help and I can now confidently make my purchase. Just one question, after looking at the comparison table above, I was wondering what is the difference between the newer models, 7865cc, 7898cc and 7899cc (besides the color)? Thank you for the kind words. That’s pretty much it — the color. The 7865cc has a slightly different LCD display, but for all practical purposes the three of them are the same. As I said in the article, I would simply buy the one I can get for less money. just to make things more complicated: here in Europe (I am actually from Germany) a “7790cc” is available and sold in a lot of shops as Series 7 790cc (!!!) now which also has the 5-way intensive/sensitive-setting and the automatic cleaning station without any active drying – unfortunately. So the main difference between this Series 7 790cc/7790cc and the 7865cc – besides the colour and display – is just the possibility to use the 970cc corded because of only dry shaving. Thank you for the info. I knew that the 7790cc was basically a silver dry only 7865cc, but I wasn’t aware that Braun actually sells it as a 790cc. It’s a bit disappointing to see Braun resorting to this type of sneaky tactics — after discretely ditching the induction heating and presenting the newer Series 7 as having 4 cutting elements. At least the shaving performance remained the same. Again, thank you for taking the time to share this with us. Very good summary! What is the lowest price you’ve seen the 790cc and 7865cc? I saw the 7865cc was $169 for a brief period on Amazon. Now the 790cc is $169 and 7865cc is $200. I am not in a hurry so I want to get a good deal. Thank you for your comment. Not counting Black Friday deals and such, I think the 7865cc was on sale for $149 until recently. Can’t really recall the lowest price of the 790cc, sorry. Keep an eye on both, you’ll likely find them at a lower price again. Also, don’t neglect other models like 799cc or 797cc if you can get a great deal on them. Thank you for your thoughtful comment, ayman. I’m glad you found the information helpful. Have had two 790 cc-4 for 15 years and still going strong. Caught this price at BJ’s and am considering 2 more for the future. You are very welcome. The answer is yes, you should be able to use your older station without any issues. Thank you very much for your amazing article! Thank you for the kind words! This a great (and quite common) question. The Series 7 models like the 7790cc, 790cc etc are suitable for dry only operation. However, many users have successfully used one with shaving cream as well. I cannot recommend using a dry only model in this manner as it goes against what the manufacturer recommends. I couldn’t tell you if there are additional gaskets or sealant fitted to the wet/dry models as that would mean taking both apart for a close inspection. They can be safely rinsed under tap water, so some waterproofing exists with the dry only variations as well. If anything happens to the shaver it will void the warranty and it’s entirely up to you if you decide to use a dry only model in this manner. Again, I cannot recommend using an electric shaver in a way that is explicitly forbidden by the manufacturer. I’m pretty sure the main reason behind this has to do with safety. Precisely, the dry only models can also be used while they’re plugged in. You can imagine the potential hazards of having a device connected to the mains and bringing it into the shower for example. Thank you very much for the amazingly detailed and thorough review of the Braun Series 7 line of shavers. Your discussion of Braun Series 7 Differences: 790cc vs 760cc vs 799cc vs 7865cc was very helpful to me. I can now go ahead and buy a replacement for my 797. With appreciation. You are very welcome, Benjamin! I’m glad to hear you found it useful. When you are referring to the “OLD” vs “NEW” cleaning stations for the series 7…I found this online … is this the ‘good’ older cleaning station?… NEW BRAUN ELECTRIC SHAVER CLEAN & RENEW FAST CHARGING STAND 81365080. Because I plan on purchasing a 7893s separately…then the Model 81365080 cleaning station separately…and finally the Cleaning cartridges. (I can get these separately for a lot less than buying the 7XXXCC model with everything included.) Based on comments before the 7893s Models do work with the cleaning stations…and that the paint may be effected after many uses. That is correct, 81365080 is the part number of the old station that comes with induction heating and quick clean mode. It should work with the 7893s without any problems. The paint will eventually flake, but that seems to happen even with the cc models after a few years of use. Thank you for your comment. I think both the 7840s and the 5030s would be very good options. However, if you can get the 7840s for a great price, I would recommend that one. To me the Series 7 feels more refined, more enjoyable to use and a bit faster compared to the Series 5, even though the end results are extremely similar in terms of comfort and closeness. You should also factor in the cost of the replacement shaving heads — the ones used by the Series 7 are usually more expensive. Thanks for an extremely informative review. I came across a reasonably priced Series 7 790cc on eBay Australia with the seller being USA based. I need clarification on two things. Firstly in your review, reference is made to the older 790cc as the 790cc-4. The model I am looking at on eBay is referred to as the 790cc-7. What does that mean? Secondly, being a USA based seller would you know if the 790cc handles 110v to 240v power or is only 110v (USA standard). Hope you can help me with these two questions. Thank you for the kind words. The 790cc-7 is a newer model that has 5 power settings instead of 3. Everything else remains the same. Since it’s fitted with an automatic voltage converter, you should have no problems using it in Australia. I buy most of my shavers from the USA and use them in Europe (220v). Ovidiu thanks so much for your efforts on all of our behalf! It was time for a new 51S for my Series 5 Braun and decided it was time to check into the newer Brauns. I’m going with a Series 7 Wet/Dry model but I’m wondering if I can use my Series 5 cleaning station with my potential Series 7 shaver. Thank you for the kind words. Unfortunately the answer is no, a Series 7 won’t work with your existing Series 5 cleaning station. The metal studs on the back of the Series 7 won’t come into contact with the small metal plates when placed inside the station. And even if they did, the station still wouldn’t be able to communicate with the shaver as it will only pair with Series 5 shavers. thanks so much for your quick reply ! You are very welcome, Dan. I’m glad I could help. Thanks for all the research and sharing this. I got my son a new Braun at Costco, but I guess it doesn’t include a cleaning station. 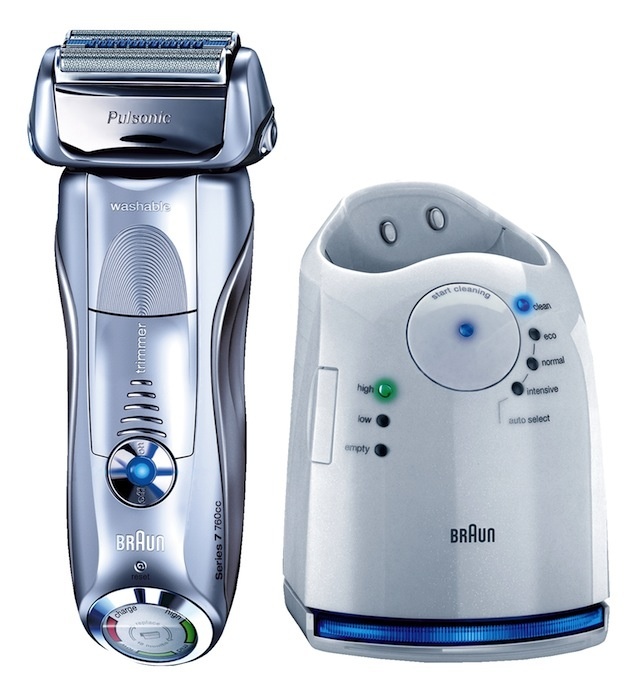 I’ve never used an electric, never liked them, but I tried his Braun 7 and it was pretty good, so I am thinking of getting one. I can get another one at Costco for about $100, or I can get NIB Braun 7898cc with a newer cleaning station for another $20, or perhaps a 7797cc with the older cleaner for about the same price. Alternatively, I can get cleaning station for about $50. The only significant difference between the 7797cc and 7898cc is in my opinion the wet/dry feature. Precisely, the 7797cc is dry only, thus it can also be used while charging. You can’t do that with the 7898cc since it’s suitable for wet/dry operation. Both of them have the updated cleaning base (no induction heating or quick clean mode). If you can get the older station for a reasonable price along with a solo Series 7 model — that’s a viable option as well. Otherwise just get one of the two mentioned previously. I personally would get the 7797cc, wet shaving doesn’t really improve my shaves with the Series 7. Thank you very much. I wound up buying a NIB 7898cc locally for $100. You are very welcome, Steve. That’s an excellent deal. Enjoy your new Series 7! Great job, now I know everything about razors … almost because I have one question, maybe you can help me ? It’s my first electric razor so I have no practise but I predict dry mode would be perfect to me. I decise to buy 790cc-4 with old CC station with heating and now I found 7898cc in same price. I wonder what is the better old CC station in 790 or wet use in 7898 ? I personally would go for the 790cc and the old cleaning station. I do enjoy a wet shave myself, but not with a Series 7 (or any other Braun shaver in general). And that’s because it doesn’t seem to make any noticeable difference compared to a dry shave which also takes less time. It’s a whole different story in the case of Panasonic razors, but with a Braun shaver I wouldn’t bother. You also get to use the 790cc while charging, which is something you can’t do with wet/dry models like the 7898cc. I have a cleaning base for my series 7 and does not have the extra button, but does have a heating symbol. The base has the part number BS5675. Does this have the induction heating element that was removed in current base models? Yes, it should have the induction heating element. It’s a version of the Series 7 cleaning base that has the drying system in place, but it lacks the fast cleaning function. I’m wondering if there’s any reason not to use shave gel with the 790cc. It’s seems the only difference between that model and the wet/dry models is that the 790cc could be used with the charging cord on. Assuming I’m not using the cable, any other reason not to try gel? You are actually spot on. The 790cc is suitable for dry only use as a safety precaution since it can also be operated with the charging cord on. The wet/dry variations only seem to be different in this regard. This is of course unofficial and Braun recommends against using a dry only model in this manner. However, many users have successfully shaved using cream or gel with their 790cc. You should proceed with care and also know that if anything happens to your shaver this will likely void the warranty. I cannot recommend using an electric shaver for anything else than its intended purpose (for obvious reasons). Excellent. I was just hoping it wouldnt damage the razor. Thank you very much for the reply and for the in depth review. Very well done. What is the difference between the 790cc-4, and 790cc -7 ? I just ordered a used 790cc-7. Thanks, I really enjoyed your thorough guidelines, braun can make things confusing sometimes! Thank you for your comment. The 790cc-7 is a newer release with 5-speed settings as opposed to 3 on the 790cc-4. Other than that they are pretty much identical. I am trying to decide between the 7893s and the 740s(cheaper). Do you (or anyone else) have any opinions? Thanks for your help. Great service you offer. Thank you for your comment. Performance-wise they are pretty much the same. The 7893s has 5 speed settings as opposed to 3 on the 740s, but this doesn’t make any significant difference. Both are suitable for wet&dry use and both will work with a Series 7 cleaning station if you decide to buy one later on. I would get the 7893s because I think it will fare better with scratches and wear and won’t show them as much as the black 740s. But again, if you can get it for significantly less money, go for it. Outstanding explanation of a complex situation. Thank you! After hours of scratching my head and wondering what was going on, it took me 5 minutes to make up my mind after reading this article. Well done. Thank you for the kind words. Glad to know you found the post useful. Enjoy your new Series 7! Thanks so much for being so detailed and concise, it’s a confusing task trying to make the best decision when there are many variations of the same model. Thanks again for providing us with this knowledge. Thank you for the kind words, I’m glad you found it useful. Very comprehensive review. But I have a question. Which model would be most suitable for a guy with very sensitive skin, who shaves every other day and wants a very close and smooth shave? Also, someone who needs a shaving gel to shave every time. All current Series 7 models are pretty much identical in terms of performance, so you can choose one based on budget and availability. I would recommend the 7865cc since it’s a wet/dry model, comes with a cleaning station and it often costs less than other similar Series 7. I think the Panasonic Arc 4 and Arc 5 will provide a closer shave compared to the Series 7, but those aren’t nearly as comfortable and forgiving. Thank you, Tracy! Glad you found it useful. I’ve recently purchased the Brain 7790cc but was shipped a 750cc-7 by mistake instead. If prices are the same, which of the models should I choose? My main focus is a shaver for sensitive skin and a close shave. I can’t really find any information on the 750cc. Thank you for your comment. The 750-cc is an older model sold on the European market, that’s why information about it is pretty scarce. It does have 3-speed settings instead of 5 and comes with the old LCD display (which is better in my opinion than the new one). Having used both 3 and 5-speed models, I haven’t noticed any significant difference between the two. I have sensitive skin as well and always use them on the highest power setting without any discomfort. Since you also got the station fitted with the inductive heating system, you could keep this one unless you have a very specific reason to opt for the newer model. 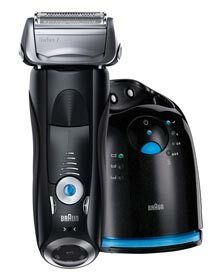 Will definitely purchase a Braun shaver series 7 when I visit my son in the USA later this year. Prices much more competitive in the USA than in Australia. Great information from website about which model to buy and the various features on offer. Thank you for your comment, Peter. Greatly appreciated. Hope you’ll enjoy shaving with your new Series 7. All the 7 series the same except for the inclusion or not of the clean and charge station in the retail box. I had a 790cc which died but the clean station was working. I bought a 7855 on special offer but expected the clean station not to work with it. To my amazement the 7855 works with the old clean station and I can clean with the cleaning solution (as confirmed in your article). Therefore anyone who has bought a S only model can buy a clean station cheaply online and use it like a CC model – therefore why pay the premium for the CC models? That is correct, thank you for your comment. If the solo model along with a separate cleaning station can be bought for less than a cc model, then that’s a perfectly viable option as well. I have one question. Is there is one model that has function wet and dry, plus cc station, and that works bouth with battery or cord plugged? I’m asking because when one day battery dies if I could use shaver without battery. Thanks! Unfortunately the answer is no, none of the wet/dry models will work with the cord plugged in. Your only option would be to get one of the older dry only variations, like the 790cc or 760cc. This is one of the best reviews/comparisons I have ever seen for any product. Great work taking away the confusion! Thank you for your comment, Steve. I really appreciate it. Thanks a lot for the clear and comprehensive explanation. I bought the 790cc in 2011 and unfortunately I lost it during a trip (probably forgot in the hotel room). I was trying to understand if I could buy one without the cleaning station but had trouble understanding the different models and if I could actually use my old cleaning station. Your article completely clarified that; I’ll buy the 7893s and save some money! You are very welcome, Angelo. I’m glad you found the information useful. Your articles and reviews are always interesting and extremely helpful! 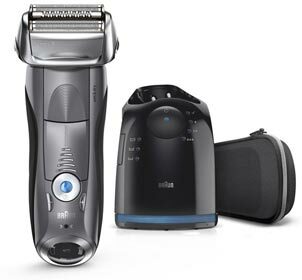 For anyone who’s interested, I’ve had the Braun 7865cc for a week now and I can definitely say that it’s by far the closest, fastest and most comfortable shaver I’ve ever had, hands down. I keep it at the highest speed setting and it plows through coarse areas quickly and easily. It shaves just about as close as a blade for me. The clean/charge station keeps it in like new condition every time I shave. I wish I would’ve saved money by choosing this model first before trying others. That’s awesome, Scott! Thank you for taking the time to comment and share your experience. I read your through analysis, so i chose my 7 series, Braun 7840 S razor, the very first electronic razor i have used. Using it by about 3 months, with shaving foam, i’m completely satisfied with it and it’s shaving performances, no more severe burns and cuts on my skin. Washing it with water, sometime adding liquid soap, and lubricating the blades with sewing machine oil. That’s great, Giovanni! Thank you for taking the time to share your experience with the Series 7. Fantastic review. A thank you note is definitely due, so thank you so much for the well written article and sharing the details. Really appreciate it. Thank you for the kind words, Kaleem. I’m glad you found the article useful. Hello, thanks for the great information. I am trying to decide which Braun series 7 I bought should I keep. They are both still in boxes. I found the 7893s at Costco for $100 and the 760cc at BJs for $129 as a clearance item. From what I am reading, they both will perform the same since they have the same heads. My main question is how much will they cost down the road to maintain? If I keep the 7893s, can I clean every day with soap and water and will it maintain its performance as long as the 760cc? How much does cleaning solution cost and how often to you have to replace? How much are replacement heads and how long do they last? Will they last longer with use of the cleaning station? Thanks for any information. That is some dilemma. First of all, I think you managed to get both at an excellent price, so whichever you end up keeping it will be a great deal. Regarding the costs of ownership, it really depends on how you’ll be using your shaver. For example, you can use the cleaning station after every use or twice a month. That’s entirely up to you. The advantage of Braun cleaning stations is that you can take out the cartridge, put the cap back on and store it until you need it again. A shaving head can last longer with the use of the cleaning station only if you fail to clean and lubricate it regularly. I would use a bit of liquid soap and warm water and a light oil (clipper oil) or a spray lubricant like the Remington Shaver Saver. I don’t usually recommend cleaning stations if they’re not needed, but I think they’re really useful with the Series 5, 7 and 9. After weeks or months of use, there will be some hairs, dirt and dead skin (that a manual cleaning failed to remove entirely) lodged inside the shaving head. An automatic cleaning will get rid of that easily. If you use your station sparingly, a refill will last for months. Here are more details about this. Also, there are third-party alternatives that cost a lot less than Braun’s solution. The two shavers are very similar performance-wise, so it’s up to you to decide which one to keep considering the advantages of the cleaning station. You can also buy the station later on separately if you decide to go with the 7893s. The replacement heads are the same for both and should easily last one and a half years. The price varies, so you should check various stores before buying. Thank you for your comment, David. Glad you found it useful. The replacement cassette foil cutters have an 11% recommendation at braun.com. The rep said they only have one cutter but their site shows a honeycomb style and also a pizza with a bullseye style foil. People swear by the original but dislike the replacement. Help!!! Can you please share the link to the bullseye style cassette? As far as I know, the 70s/70b are only available with the honeycomb-like foil pattern (Braun calls it an Optifoil). In general, replacement parts get really bad reviews (not just the ones from Braun). I only bought a Series 7 cassette once, it was like 4 years ago and it still works (honeycomb style). I didn’t however use that shaver as much, so it’s not really relevant from a reliability pov. Thank you so much for your amazing informative website/article! 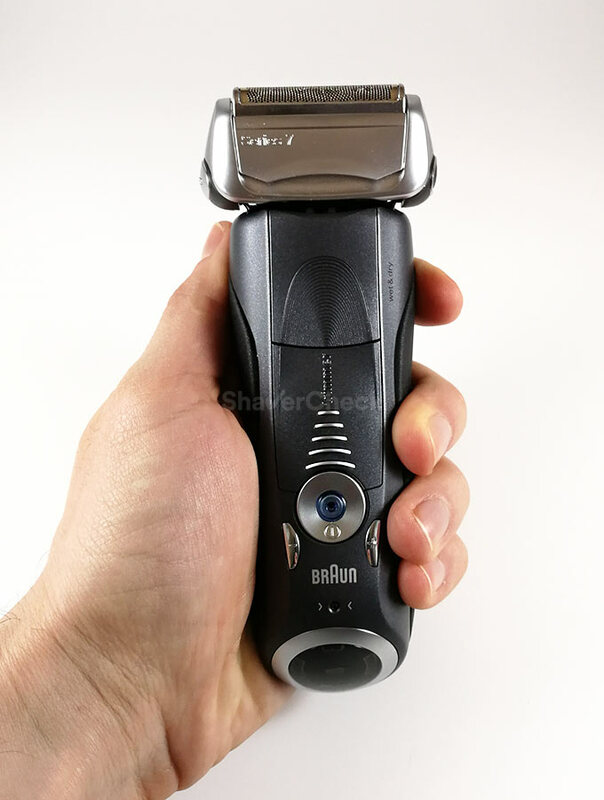 It helped me choose the right Braun Series 7 shaver at the best cost! My original Braun 8585, which I have been using since forever has finally died, fell apart to pieces! After buying multiple replacement heads and cleaning solutions, I thought it was time to upgrade/replace. It was a really close shave when it was new. My cleaning station still works perfectly, however finding a replacement shaver for this old series is not very cost effective. Do you know if my old cleaning station had inductive heating? As it felt like my shaver was always dry/hot after a cleaning cycle. I wanted this feature in a replacement shaver I wanted to purchase. Before I found and read your website/article, I was considering buying a Series 5 shaver at the store. However, I purchased a replacement Braun Series 3 3050cc at the store on sale for $105.96 CDN. I returned the Braun 3050cc to the store. Lacked key higher end features etc…. For only a slightly higher overall total cost, I purchased on Ebay a Braun 7893s and a separate New Inductive Cleaning Station! I saved a ton of money thanks to you! 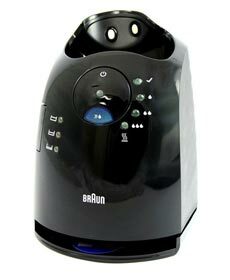 Way cheaper than the local Walmart for the Retail Braun 7865cc which is $249.96 CDN! Is it safe to say that when I get my new Braun 7893s it will blow away my old 8585?! It was a really smooth and close shave when it was new. Thank you again for such an amazing thorough articles regarding Braun Series shavers! Thank you so much for the kind words, I’m glad you found the information useful. The station of your 8585 was indeed fitted with an inductive heating system. The 7893s is a superior shaver in terms of shaving performance and you should definitely notice that. The manual is written that processes at drying occurs. Thank you for your comment. The part about drying the shaver only applies to the older Series 7 models that came with the discontinued stations that were fitted with the inductive heating system. First of all, GREAT review! And not just this one. If it were up to Braun, then nobody would know what they were buying. But I have a question. You wrote that they removed the drying part from the 7 series’s cleaning station. And i read articles about that over time razer blades dullness in big part is thanks to that, that they remain wet after every shave and it causes micro rusts on the blades edges. That rust will flake off and eventially you cut yourself. Now this isn’t a razer blade but i think the principle the same, it has blades in it. So if I use the CC station and it won’t dry it off, wouldn’t it shorten the shaving head lifetime? Or it won’t beacuse it it alcohol based. And another thing, in another article you wrote that the every day use of the CC station is unnesesery. And between those clean it with for exempe tap water. But I plan to use shaveing cream in hope for a closer shave or at least I want to try it. But will the water clean it out properly, and agan… that rust thing. Those are some excellent questions. In my opinion rust is not a problem with modern electric shavers from reputable manufacturers like Braun. I’ve been using them for almost 20 years and I am yet to see rust. Again, with high-quality stainless steel and other anti-corrosive treatments that are applied to the cutting edge of the blades, you won’t have a problem with rust. It goes a lot more into these blades compared to regular, cheap double edge razor blades. So I am certain there won’t be any problems in this regard with new cleaning stations that lack any drying systems. Even if you clean your razor with water and let it air dry it’s still perfectly fine. In my opinion this will not affect the lifespan of the blades. Improper cleaning and lack of lubrication will. Regarding shaving cream, if you clean your shaver with water and soap and every once in a while using the station, that would be very effective. A bit of shaving cream could remain inside the cassette after a manual cleaning and it can dry and harden. That, along with mineral deposits from hard water can lead to some nasty buildups. But if you use warm water and liquid soap and also use the station a few times a month for example, problem solved. Also, after a water & soap cleaning (with the shaving head completely dry) make sure to lubricate the blades using a light oil (like clipper oil) or a spray lubricant (Remington Shaver Saver or Braun spray cleaner). Here‘s a detailed guide. 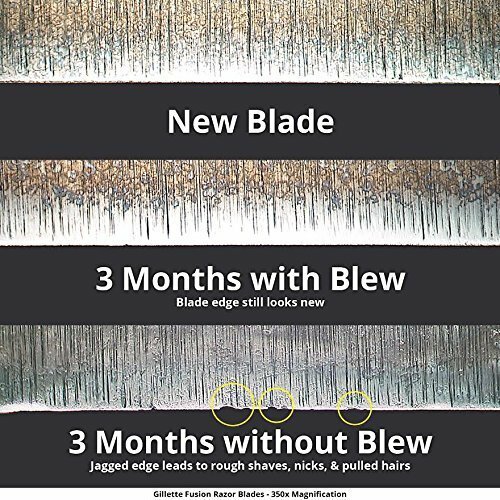 which basically all it does is dry the blade in a few minutes instead of airdrying it, and that is it. I was thinking along the lines of something like this problem only with electric shavers. And for the other part, the whole point of electric shawer + CC for me is the convenience and time save. So the whole manual cleaning you wrote is out of the question 🙁 . Even the wet shave would be a nuisance, but for a closer shave I would try to use it. And I plan to close the alcohol-based solution after use so it won’t evaporate. And rinsing the head under water quickly and into the CC every time. But did I understand correctly, even if I use the shaver and the CC every day (I shave every day), even by Braun’s standard it dosen’t need replacing for a few mounths? What are they thinking? With what, a hair dryer? And isn’t the whole point of the CC that it dose everyting by it self? Maybe I should stick to dry shave but the problem is I don’t know how close a shave it does, and the 7 series a bit pricey for gamble… or just switch to Gillette, it would be a lot cheaper too. You are very welcome, Istvan. Again, I have to stress that it is extremely unlikely to experience any kind of water induced damage to the blades of an electric shaver. The cutting edge is different, the steel alloys are different and you cannot simply compare them to a regular razor blade. Besides, physical wear caused by the friction between the blades and the foils will be experienced long before any potential rust issues. As for the manual and automatic cleaning, everyone should use whatever works best for them, be it one or the other or a combination of both. Many users prefer the latter as a way of saving cleaning fluid and reducing the costs. For example, it takes me less than 30 seconds to clean a shaver with water and soap, so it’s really not a hassle. With proper use and care, a shaving head should easily last a few months, even if you shave daily. 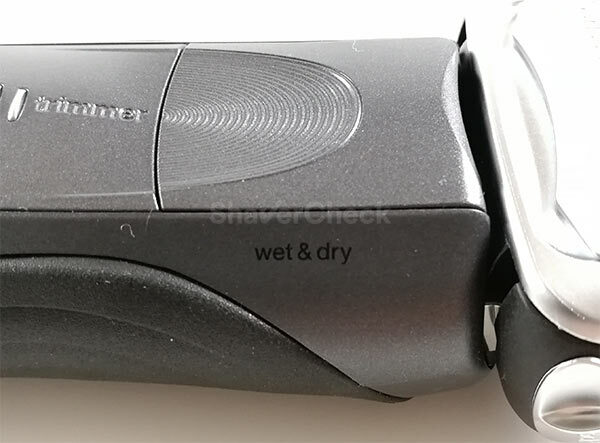 Regarding the shaver needing to be dry before the automatic cleaning, this is what Braun recommends so they can be perfectly covered (improper use). Lather, soap and other similar stuff could potentially clog the drain hole of the station or the mesh filter inside the cartridge. 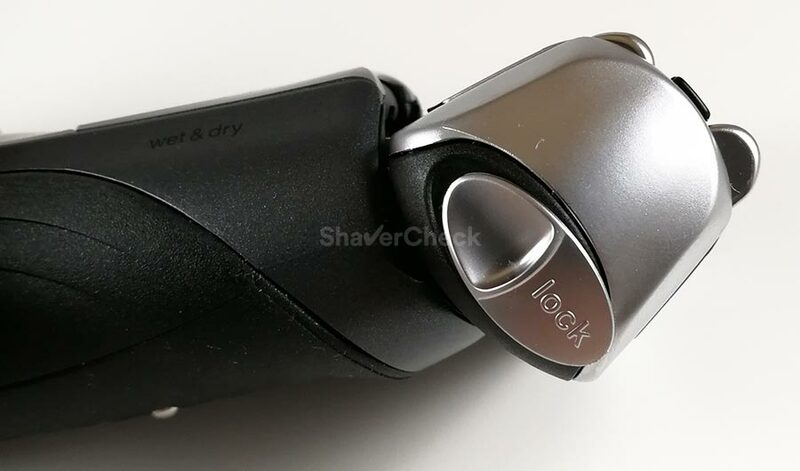 Also, if the shaver head is dripping wet every time you clean it, that excess water will end up in the alcohol-based solution and this will affect its electrical conductivity. And the station uses it to determine when to signal the user to replace the cartridge. So this could result in a premature false reading. That’s why it’s a good idea to try and have the razor as dry and free of any lather/foam before using the station. Thank you agan for the thorough answer. I finally understud that rust is not a problem :), but I did not know that the blades tuch the foil. I suppose if you want cleaner shave, friction and physical wear the price. And the way it’s measures and signal the user to replace the cartridge is interesting too. I finally decided upon the 7 series beacuse you wrote in the comparison that there isn’t much of a difference in closeness between 7 nad 9, and the 7 is good for very sensitive skin too. The other contender was Gillette, but as I have found out in the last few days, you can’t have that smooth shave all the time. Just for a day, than 2-3 day beard, beacuse the skin will be too sensitive to shave agan…or at least mine. So it’s advantage became it’s disadvantage. Except it’s a lot lot cheaper. And if I properly clean it and put it in the CC every day then I wouldn’t need to use oil to lubricate it, beacuse the CC dose it, right? And the CC wont get dirty quickly beacuse the head was clean, right? Although I still don’t know how to dry it in the morning rush. That is correct, using the cc station daily will take care of lubrication as well, so there’s no need to use anything else. Regarding the cleaning and drying, as long as you shake off excess water and pat the shaving head dry with a clean cloth or paper tissue, it should be fine. I was actually planning on doing a detailed cleaning tutorial but never got to it. It is coming though. Thank you for this write-up. You’ve brought order to the chaos that is the 7 Series! Thank you for your comment, I really appreciate it. Glad you found the article useful! Apart from the color (silver for the 7893s and black for the 740s) and 5 vs 3 power settings respectively, there aren’t really any differences. They use the same shaving heads and both are suitable for wet & dry use. I would go for the 7893s as the fifth power setting is supposedly 12% faster than the third one on the 740s. Very much looking forward to Ovidiu’s response / advice of my Braun shaver selection. I sent in my dilemma last week … March 3rd ? Have not seen his response posted yet or an email. PLEASE ADVISE WHEN I MIGHT HEAR BACK. THANK YOU. I actually replied on March 4th, but you submitted your comment to a different article. You can check it out at this link.